The Karen Wellington Foundation is one of Kent's labors of love. Formed after the loss of his late wife, KWF "creates Fun Now for women and families LIVING with breast cancer." Kent Wellington’s family never stayed in one place too long. That can be hard for a kid, but it wasn’t for Kent. He figured out early on how to land on his feet. He had a confidence he could fit in and build new friendships anywhere. He thanks his parents for that. They had other jobs, he says, but it was clear to Kent and his sister that they saw their most important job as being parents. He has a place in his heart for kids who don’t have that same good fortune. “About half of the 30,000 kids in Cincinnati Public Schools are seriously at risk,” he says. That’s why he’s been involved in mentoring almost since coming to Cincinnati in 1991. It’s why he serves as chairman of the Cincinnati Youth Collaborative Board and a mentor, among his other civic roles. Kent likes to load up his plate. At Kenyon College, where he double-majored in English and economics, he also played football and basketball. When he joined the Firm, he continued to play basketball four nights a week, but he also took up triathlons – short ones and long ones. His competitive spirit, a natural outgrowth of the confidence his parents instilled, serves him well in law. As a lawyer, he says, you compete. “The arena is different, but it still gets the juices flowing. It’s great when you can come through for the client. When the verdict comes in and it’s in your favor – or better, when a case is dismissed at summary judgment and the client doesn’t have to sit through a seven-day jury trial. These days, Kent is doing his best to do for his two children, Angeline and Robby, what his parents did for him. Except that he’s on his own now. In the summer of 2007, his wife, Karen, died. She had been diagnosed with breast cancer 10 years earlier. They met before he was in law school at Ohio State. He recalls that she didn’t think she had her A-game that night, but she turned his head without much trouble. Those who knew her say Karen brought her A-game to everything she did and pushed her family to do the same – whether it was about how her children threw themselves into soccer or how her husband carried himself as an athlete, a community leader and an attorney. Kent has a diverse practice with an emphasis in litigation and labor/ employment law. Kent has tried cases to favorable jury verdicts in all the local state and federal courts, but prides himself on avoiding litigation and getting cases resolved quickly and cost effectively. 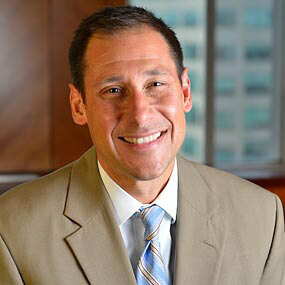 Kent is the immediate past chair of the Firm’s Litigation Group and currently serves on the firm’s Executive Committee. Professionally, he is most proud of the strong client relationships and client friendships he has developed over the years. Kent was described by the GM/CEO of one large publically traded client as follows: “What has always impressed me about Kent is his emotional intelligence. He exudes a great deal of confidence and he is aggressive in his pursuit of any issue, yet he is compassionate and caring in the process. He is able to make all kinds of people feel very comfortable around him.” Based on client comments like this and the grading and comments of his peers, Kent is recognized with an AV Rating, the highest rating given to lawyers by Martindale-Hubbell. Since 2005, Kent has been recognized every year as a “Super Lawyer” (or “Rising Star”). Only 2.5 percent of Ohio lawyers receive this honor. In 2004, the Cincinnati “Business Courier” named Kent (along with his late wife, Karen) two of Cincinnati’s top “Forty under 40.” Kent also has received awards from the American (1997), Ohio (2000) and Cincinnati (2008) Bar Associations, The Ohio State University College of Law (2001), the Cincinnatus Society (2002), and the Cincinnati Park Board (2015). Kent has two primary passions outside of work: mentoring vulnerable kids (for the past 25 years) and putting some FUN on the calendars of families LIVING with cancer (for the past 10 years). A leader in our Graydon on Main Office, Kent also spends a significant amount of time in our downtown OTR neighborhood through Saturday Hoops, Dribblethon, and other not-for-profit, entrepreneurial, and faith-based groups. On September 26, 2006, President George W. Bush presented Kent with the President’s Volunteer Service Award. Kent also received leadership and advocacy awards in 2004 from both The Arc-Hamilton County (MR/DD) and W.E.B. DuBois Academy (OTR), from St. Aloysius Orphanage (in 2011), and the “Linda K. Heines Award of Inspiration and Hope” (with his two children) from the Breast Cancer Alliance in 2013. Kent is also a graduate of the United Way BOLD program, the Cincinnati Academy of Leadership for Lawyers (“CALL), and Leadership Cincinnati (Class 39). Kent resides in Mt. Lookout and his son Robby (21) and daughter Angeline (19) live nearby at the University of Cincinnati. Kent also enjoys biking, running, swimming and coaching basketball. He has competed in triathlons since the early 1990’s, including the Escape from Alcatraz triathlon and several 1/2 Ironman’s.